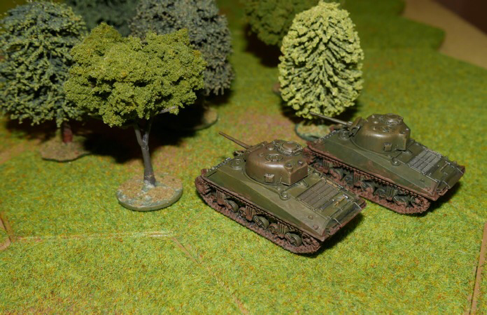 TANKS - produced by Gale Force Nine, is a themed tactical WWII game played on a small table area with some quite interesting mechanics. It uses fast self assembly 15mm plastic tanks (Battlefront models) and the base set seems very good value. We took it for a spin recently. The following post has a look at the essential elements of the system. Gale Force Nine have produced a base set that can be picked up in the UK for around £15, this is superb value, as the three model kits that you get in the game are worth that alone. The box provides a German Panther (can be built as a JagdPanther instead) and two Shermans which have both 75mm and 76mm turrets. These models are in 15mm and appear to be manufactured by Battlefront, so are very nice proper wargame models. 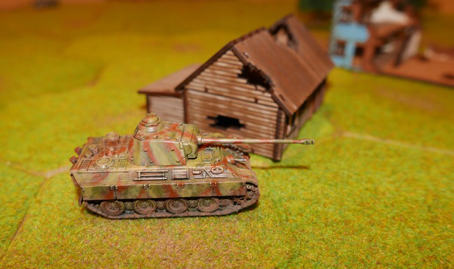 (Note in the photographs, I have used my wargame terrain rather than the the 2D supplied terrain templates). The rulebook is 20 pages long, but the rules only amount to around 7 pages and these are very heavily illustrated, so the text and system is very accessible. The booklet is nicely presented on heavy paper and in full colour. 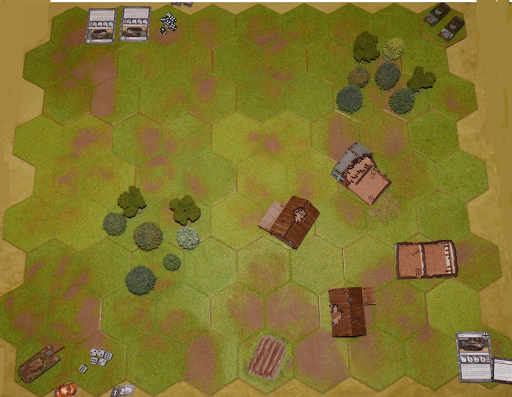 We get heavy card sheets of 2D terrain that provide four buildings and two Woodland pieces. Game tokens and measuring arrows are also done in thick card. The rulebook covers the common German, British, U.S. and Russian vehicles. There are three types of playing cards and they have been supplied in good numbers. 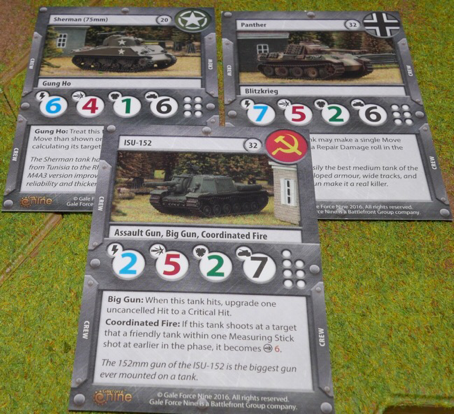 Firstly are the statistic cards, one per vehicle and the base set has cards for other models that the gamer may already own such as T-34's, SU 152's and Pershings. There are cards that can be used to 'enhance' each vehicle by adding expert crew characters or extras such as sandbag armour etc. Finally there is a 'Critical Hit' deck - this deck brings a lot of nuance to play. 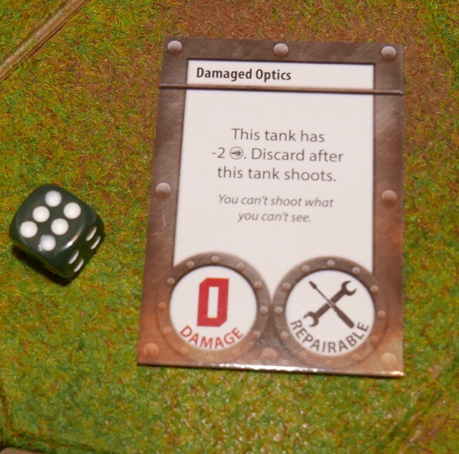 Each time the target suffer a HIT caused by a die roll of 6, it must draw a Critical Hit card (shown below), which outlines the nature of damage, some of which will be repairable. The package is rounded out with six D6 per player. 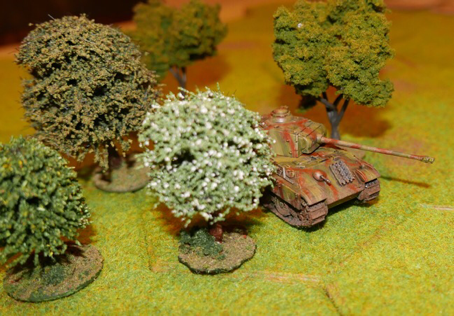 Since release, a growing number of blister packs have been made available, most recently the Puma armoured car and the Tiger I tank. Each of these include their own cards to add to the various supplied decks. They make interesting additions to the game and do expand functionality and game play, but the blisters are also useful for gamers who collect 15mm for skirmish type games and only ever want one or two models of a certain type and who don't want to be forced down the five vehicle 'platoon' type packs that Plastic 15mm's are commonly sold in. As its heart, the game is based around the order that vehicles are activated in and a system of Hits and Saves. The order of play is basically movement, followed by fire, followed by a command phase (best thought of as an admin phase). Play is interactive. Every vehicle is rated for Initiative. During the movement phase, players move with the lowest Initiative vehicles going first, then in the fire phase the vehicles with the highest initiative fire first. 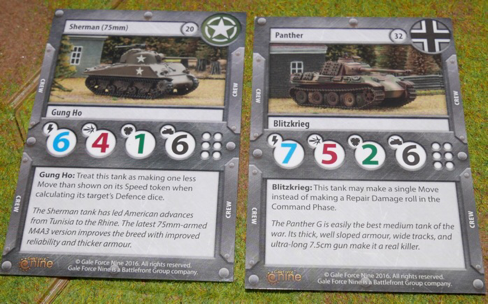 In some respects, the base game does not take full advantage of the nuances that fall from this initiative system, since the Panther is rated with an initiative of 7 And the Shermans are rated 6, so in starter games it will always be the case the the Shermans move first and the Panther fires first. Once you bring a few other vehicles into play, this changes. So if we bring in a StuG III assault gun, this has an Initiative rating of 3 and there becomes a more interesting inter-play between the forces as they take their place in the queue to activate. 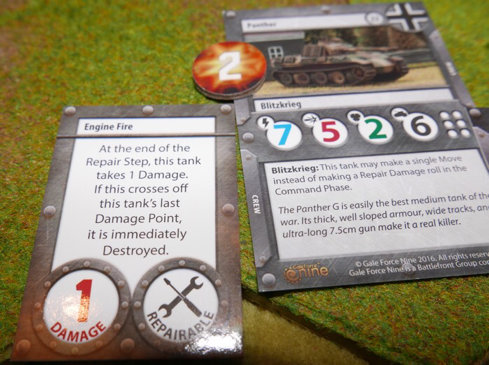 On the card below, the first number (in blue) is the `Initiative rating, the second number is Firepower, the third is armour and the fourth is the number of hits that a vehicle can absorb before it is destroyed. The dots at the end of the row are for those who want to mark off hits on the card itself ...... for the rest of us, we are given hit markers that we can simply place on the card! 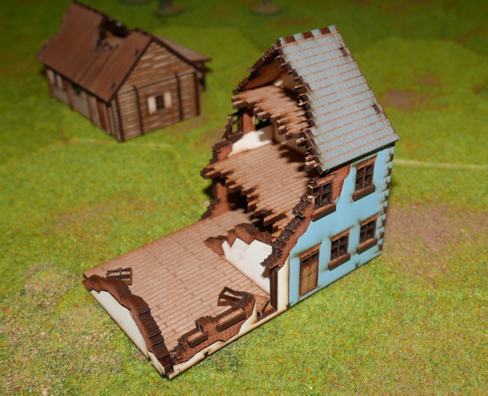 At this point, it is worth reminding ourselves that this really is just a themed and fun game, but of course the wargamer will still look at it with an eye of how 'successful' the theming is as much as how good a game it is. Where better to start than our basic game models, the German Panther and the U.S. Shermans (both 75mm and 76mm variants). Each nationality gets its own special rule - for the Germans, this is 'Blitzkrieg', which essentially allows a vehicle during the end of turn Command Phase, to trade away their 'repair' sub-phase for the ability to move once more. In essence, this is probably reflecting a higher command capability, so that the German force is faster and more responsive over the course of a game. The U.S. have 'Gung-Ho', which essentially means that when they fire at an enemy after moving, their penalty for having moved is reduced by 1 D6. I can only assume that they have decided to take into account the gyro-stabiliser that was on the tank ...... but which in reality was generally sufficiently problematic enough that a lot of crews just switched them off. I am at a bit of a loss to understand why this particular trait was chosen, the rule itself feels a little counter-intuitive in play (I have to keep on checking the text to make sure I have it the right way around) and it has the effect of making the Sherman fire more effective or looked at another way, it reduces the effectiveness of the defence by increasing the chances of over-whelming the defensive ability to counter the hits with their saves. This feels particularly odd in the base game because we are putting a Sherman up against a Panther and on a 1:1, why would you give the Sherman advantages on a gun / armour process? - anyway, that aside, the values on the vehicles work quite well to reflect the machines they represent. 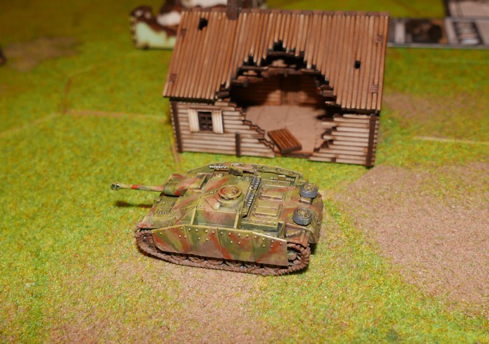 The firepower is always constant, in attack, a Panther will always roll 5 dice and a Sherman 75mm will roll 4 dice (the 76mm version rolls 5 dice). You are looking for 4's, 5's and 6's for Hits. The target will then roll their armour dice to try and negate some or all of those hits. 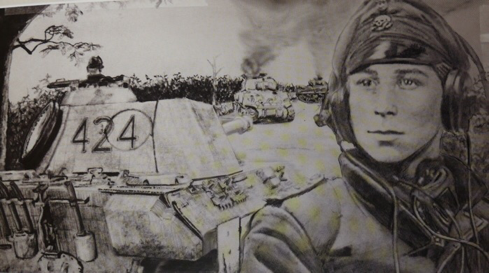 A Panther has an armour of 2 (so they start with two dice) and a Sherman has an armour of 1 (so they start with 1 dice). 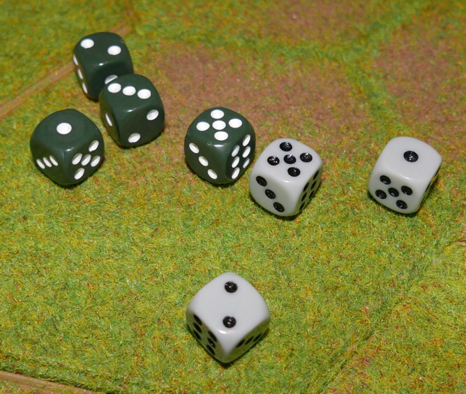 To this defensive dice, the target will get 1 dice for each span of movement the enemy made before fire (1 or 2) and 1 dice for each time it moved itself before being fired at (1 or 2). There is also a 1 die bonus for being in cover. The target can lose 1 D6 if attacked in the flank and 1 D6 for being fired at from a close up position. So it will not be unusual for a target to be rolling between 3 and 5 dice for its saves. They also need to roll 4's, 5's and 6's to negate the hits. For each defensive 4 or 5 rolled, the firer will decide which of their hit dice will be negated, but for each 6 rolled, the target will choose. The importance of this is that a 4 or 5 is just a plain single hit on the enemy, whilst a 6 is a Critical Hit and for each of those, a Critical Hit card is drawn. This might just allocate some more damage, but it might also stop the tank from moving (engine damage say) or stop the gun from firing, or have the gun fire at reduced capability etc. So an attacker will want their sixes to get through and the defender will want to negate them. The Critical Hit cards do add a nice nuance and narrative to play. Some Critical Hits can be repaired. In a players command phase, they roll a D6 and on a 4, 5 or 6 they remove the damage card. Going beyond the base game and having a few tanks per side plays to the strengths of these mechanics. Now, having a tank with high initiative firing first sounds good, but then you realise that even if you destroy the target, it will not be removed from play until the Command Phase, so it will have a chance to fire back - so you may wonder what is the point of that. But your fire may via a Critical Hit, jam the enemy turret, or stun the crew, or damage their optics or cause them to bail out - in other words, firing first may well mean that the other tank actually never gets too fire, such is the importance of getting Critical Hits. Movement is dream easy! Using the supplied movement arrow (four inches / 100mm), you place it anywhere around the tank and point it in any direction. You then lift the tank and place any one corner of the vehicle at right angles directly behind and snug up to the arrowhead, making movement very flexible. For our game, we played on Kallistra Hexon 4" terrain, using it simply to control movement - there is absolutely no need to do this, but I have the terrain, like it, so used it. It did save us measuring out every move and must have significantly increased the pace of the game. Each hex is exactly the same size as the measuring arrow anyway, so the integrity of the system is preserved. The game area is set at 3' x 3' (roughly 900mm x 900mm), so this is very much a kitchen table game, with players easily managing manoeuvres across the table. Fire ranges are unlimited and terrain can both block line of sight and provide cover. The result is that the game is very much a cat and mouse affair, as players try to out manoeuvre the other to give fire without suffering harm themselves. This feels like a lot of fun, but it also can have the tanks running about all over the place, sometimes in an unlikely way, but the latter can be forgiven because the fun factor and engagement levels are high. 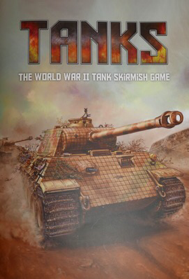 Conclusion: TANKS is a fun game, that is light enough on rules that you can concentrate on the fun tactics. The variables in vehicle ratings, the added character and equipment cards and the effects of critical hits, give an engaging game. It will not replace the 'more serious' rule sets, but then it is doing a different job. 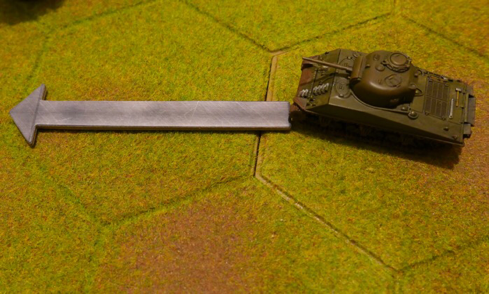 I suppose the main oddity from my perspective is that each model represents a single tank, yet it takes several hits to knock one out, there is never that one shot - Kabooom moment. I mostly accept this by seeing hits as being a combination of damage and psychological impact accumulating on the crews and that the term critical hits tends to suggest that all other 'normal' hits are not critical ....... in any case, we need to remind ourselves that this is a heavily themed game and not a simulation. There are plenty of other places to go for simulation ..... and not all are as much fun! For its money, it is certainly worth having a look at it, because even if you decide you don't like the game, you do get the fast assembly 15mm model kits and the 2D terrain, which of itself can be a good set for gamers having a dabble in wargaming or wanting a travel set. Price wise, it is in the ball-park area of being a suitable gift in your evil plan to get someone involved in gaming. Solitaire: The game works fine solitaire and is helped by the initiative system, which causes inter-play between the two sides. Size: A 3' x 3' play area brings us into the arena of kitchen table gaming and you do not really need much space to the side for the card piles. If you use the 2D terrain and a fold down cloth, this also makes for a suitable vacation or travel package. Time: Slightly depends on the number of vehicles in play, but 30 - 40 minutes for a smallish game seems about right. Complexity: The game almost bends over backwards to ease you into play with easy rules, plenty of illustrations, a starting scenario and most of the gaming information held on the cards. A difficulty rating of around 2 out of 10 seems fair and the package would be an ideal introduction for anyone who has never even played a wargame. The model kits need gluing together, they are considered fast assembly, but this must be seen in the context that they are not modeller type kits that have a huge number of parts. Here we are seeing entire wheel and track assemblies represented in a single piece per side of the vehicle. Expect to spend around 30 - 40 minutes on each model. These do make up into proper wargame models, with good surface detail. Norm, you have written an excellent review of this little game. Everything needed for a potential gamer to make a decision. I like the small price of entry for either a casual or non-wargamer friend. One question about the rules' process; a tank destroyed by an opponent in an opponent's player turn may fire back in its half of the turn but that same tank taking a critical hit from an opponent does not fire back? That seems odd. You can destroy a tank and it can fire back but jam the turret via a CH and no return fire. How do you explain that? The fire phase is fully interactive to the point that it is very close to being simultaneous .... but not quite simultaneous, so turns are not taken in the usual sense. It does seem odd that any sort of kill is not instantly counted, as that would fully give the ordering of fire it's full significance - however, the fixed initiative means that say a Panther will ALWAYS get the jump on a Sherman, when clearly in real combat that would not be true. I am guessing that it is just something of a gamey mechanic that brings the gameplay back into balance, so that the Critical Hit cards alone bring some finesse to play and that a tank with hits on does not simply hide away and cause the game to bog down. Norm, thanks for the review. Certainly seems like this would be the game for some one (like me) who might simply wants to occasionally dabble in relatively modern armor warfare. A well balanced and comprehensive review. Well done Norm. I recently bought a copy of Airfix Battles. Have you seen it? If so, which game do you feel is better? Is it worth having both games? Thanks all for visiting and commenting. Chris, I have not played Airfix Battles - on the day at the game show, I did have both games in my hand and went with TANKS. I had done a bit of reading on the Airfix Battles and decided that the game too driven by the cards for my liking. I prefer card assisted rather than card driven systems. People who have the Airfix set seem to like it and have done repeated plays, so it must have its merits. Also it has 2D card vehicles, so there is no kit building to play the basic game out of the box and that probably makes a buying difference to some punters. I would check YouTube and see some games being played out, I know there are a few videos for TANKS - not sure about the Airfix game. P.S. 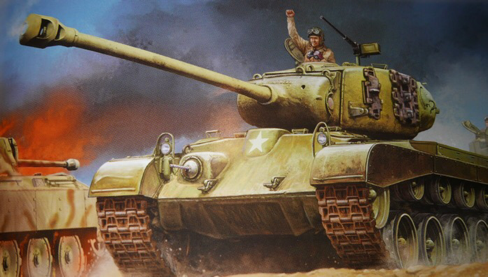 Airfix is based around their 1/72 models (20mm ish) and TANKS includes 15mm kits. 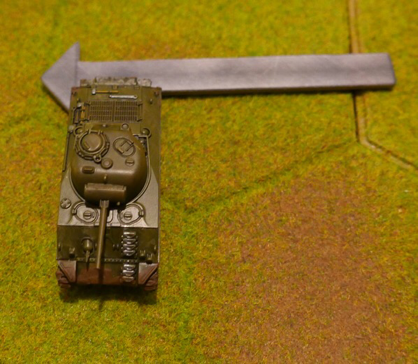 If you already have 20mm vehicles, you could use them with TANKS - though I would move up from a 3' x 3' space to a 4' x 4' and change the movement arrow from 4" to 6". Also note the TANKS system does NOT have any units other than armoured vehicles, infantry or anti-tank guns or artillery are not part of the system, that might be your point of decision.